The Holy Stone F181 is a high quality quadcopter with a menacing look,ready to take over your spare time. The quad is nicely designed and well built, it has lots of fans already. Despite being built in China it’s one of those great looking and very durable quadcopters. The quadrotor can do flips and rolls on a push of a button, so get ready to impress your friends! The range is 50 to 100 meters depending on the conditions, and the flight is very stable, thanks to it’s 6 axis gyro system. Hovering in place is no problem for the quad either, even though it has no GPS. The quad has no artificial height limitation, so it can fly upwards as long as it does not lose contact. If the Holy Stone F181 goes out of range it simply shuts down, so be careful when testing the range. 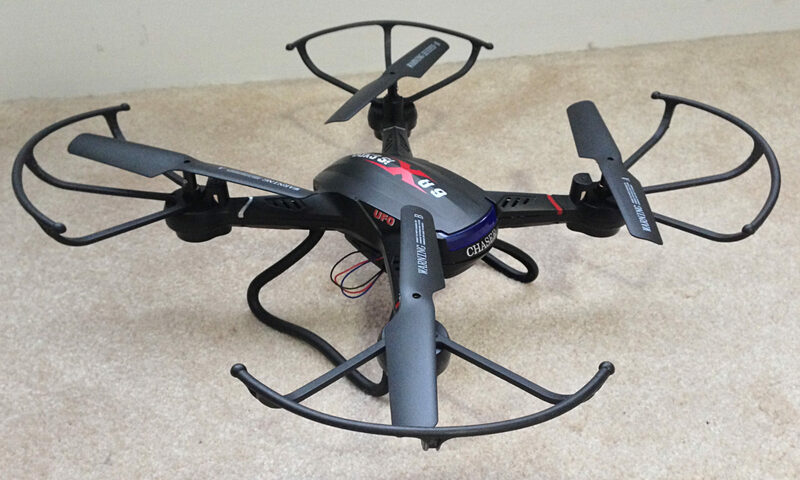 Indoor flying is a possibility too, so rainy days are no problem with this quadcopter. The Holy Stone F181 quadcopter comes complete with prop guards and legs,which make flying risk-free, and landing a breeze. Spare parts are available for the F181, for example Amazon has spare batteries, spare motors, and replacement props, skids and prop guards too. The Holy Stone F181 weighs around 138 grams with everything on, so it’s way below the FAA’s registration limit, which is a plus. Size is 30cm X 30cm.It can lift around 10 grams with the default configuration, and 35 grams when the legs, prop guards and the camera is removed, though it will surely break a sweat. To put this into perspective, lifting small plastic toys, or another keychain-style camera is no problem for this quadcopter, lifting a GoPRO is out of question. The wind resistance of the Holy Stone F181 is fairly good – you can fly in winds up to 15 kmh (10 mph), or even more if you are an advanced pilot. For windy days removing the guards, legs and camera can help as it will reduce the drag, however your quadcopter will be more susceptible to crashing than usual due to the wind, so be careful. The box comes with everything you need for flying, except for the 4xAAbatteries for the transmitter. Suggested age for the Holy Stone F181 is 14 years and up; the quadcopter contains small parts, so keep it out of the reach of little children. The F181 has multiple modes for beginner to advanced pilots, and features a headless mode too which helps a lot when you are a bit lost. (Headless mode means that the quadcopter will remember it’s initial orientation, and the forward/backward/left/right sticks will work with the initial orientation,not the quad’s actual orientation). The F181 is not fast, and turning radius is a bit large too – on the upside the videos are steady compared to the competition. The quadcopter has limited return home functionality, it will fly in the opposite direction it was first flown on the press of a button. Automatic landing is not supported, however it’s really easy to land this quad. The F181 supports gyro sensitivity setting, pressing the top left button will cycle you through the four modes: 25% (1 beep), 50% (2 beeps), 75% (3beeps), 100% (4 beeps). The shipping size is around 40x50x10 cm, shipping weight is 1.7 pounds. The suggested age by the manufacturer is 14 years and up. The quadcopter has small parts,so make sure little children can’t reach it. The F181 comes with really bright LEDs which make night flying a breeze.Even better, the LEDs can be controlled from the transmitter, so you can turn them off to fly a little longer. The F181’s drive train is geared, which makes it easier for the motors to spin up the props. is very ergonomic, and fits the hands nicely. It uses the standard 2.4Ghz technology, which is interference-free, so you will be able to fly with your friends and others together. The transmitter is mode 2. The quadcopter and the transmitter bind automatically, all you have to do is switch the quadcopter on, set throttle to the minimum, then turn the transmitter on and push the throttle to the maximum and back to the minimum again. You will hear a beep after this, and the quad’s lights will turn solid. is a 3.7 volt Li-Po one, with a charge time of80 to 100 minutes, and a flying time of 7 to 9 minutes. The battery capacity is 750mAh, upgraded batteries are available. The Holy Stone F181 comes with two batteries, which is a nice extra from the manufacturer. Charging is via the USB based charger, just plug it into an USB port (iPhone charger is good for this) and wait for the LEDs to turn solid or green. The quadcopter comes with two chargers, so you can charge both batteries before heading out to fly. The batteries use a JST plug, so they are compatible with a wide range of chargers. has a 1280 X 720 pixel resolution, the frame rate is 30 frames per second. You can start the recording by pressing a button on the transmitter. Taking photos is just as easy too. The quad is non-fpv,so you will not need a smartphone nor does the transmitter have a holder fora smartphone. The videos are save in an MJPEG format, the file extension is .AVI. As such any player can play the F181’s videos. Videos are recorded to the MicroSD card in the camera, and the F181 comes with a 2GB MicroSD card, and an USBcard reader, so you have everything for recording right out of the box. Audio is recorded too, however the prop and wind noise is pretty strong. The video and photo quality is good, as the F181 was designed for aerial photography the recordings are stable compared to other quadrotors. The camera is fixed in place by two hook-arms, and it’s fairly easy to remove and reattach. You can adjust the camera a little bit upwards and downwards, but no sideways rotation is possible. The camera status (recording or not) is displayed on the LCD screen of the transmitter. It’s important to stop the recording before powering off the F181, or the video files could get damaged. The Holy Stone F181 is great quadcopter, especially for aerial photography. Modsynergy has a detailed review of the Holy Stone F181. The manual for the Holy Stone F series quadcopters is available online on Slideshare.You may also like the Holy Stone F180C (this is a bit smaller) or the Syma X5C (this one is a bit larger). What is a quadcopter gimbal?